Bhiksuni Dr. Karma Lekshe Tsomo is an assistant professor of Theology and Religious Studies at the University of San Diego. She teaches classes in Buddhism and World Religions. She studied Buddhism in Dharmsala, India for 15 years. Later, she completed her doctorate in philosophy at the University of Hawaii, USA. Her doctoral research specialized on death and identity in China and Tibet. She currently specializes in Buddhist philosophical systems, comparative religion, gender issues in Buddhism, as well as, Buddhism and bioethics. Her research and publications focus on women in Buddhism, Buddhist monasticism, death and dying, Buddhist - Christian dialogue, and the Western adaptation of Buddhism. She also teaches meditation in the California State Prison System. As an American Bhiksuni practicing in the Tibetan tradition. Dr. Karma Lekshe Tsomo is a founder and currently serves as President of Sakyadhita International Association of Buddhist Women. Since 1987, she has helped coordinate numerous national and international conferences on women in Buddhism. 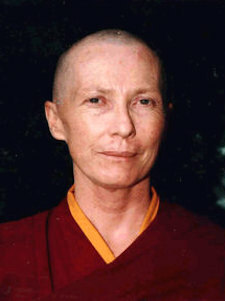 Her publications include: Sakyadhita: Daughter of the Buddha; Buddhism Through American Women’s Eyes; Sisters in Solitude: Two Traditions of Monastic Ethics for Women; Buddhist Women Across Cultures: Realization; Innovative Buddhist Women: Swimming Against the Stream; and Buddhist Women and Social Justice: Ideals, Challenges and Achievements. She is the Director of Jamyang Foundation, an initiative to provide educational opportunities for women in developing countries, including 13 monasteries in the Indian Himalayas and a primary school in Bangladesh.